Hunted by terrorist assassins working for the elusive Bloodstone, Lake County Sheriff Bud Blair uses the ego and the arrogance of a former congressman to set a trap for a Colombian drug lord. NCIS, the FBI, and the U.S. Coast Guard wait for the trap to be sprung while Bud battles the paid assassins in the Oregon High Desert. At risk are Bud’s life, his career, and his upcoming marriage to the beautiful Yakima Indian woman, Nancy Sixkiller. But when Bud is injured in a gun battle, he and Nancy face a difficult and painful decision. 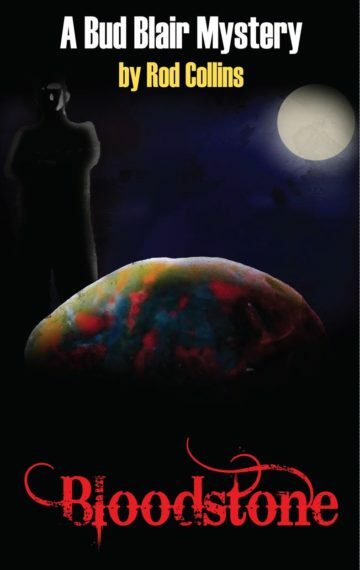 I read this author’s second book, Stone Fly, before reading this and was so impressed I looked for other works of his. Bloodstone is the third in a series but, unlike many new authors, each is a stand-alone. The characters are so well developed that you soon feel as if you know them and, with those who reappear, they seem like old friends. Despite the warmth and humor, this is a police story, a mystery, a thriller, and will hold your attention throughout. An added plus are descriptions of rural Oregon, brief enough not to bore and vivid enough to capture your imagination (as possibly lure you to visit). The third of the Collins novels that are on the Amazon Kindle list, but I hear through the grapevine there are more to come. As a fan of the Collins style of writing I am patiently waiting his next novel.